St. Mary's la Prairie Anglican Church was constructed in 1898. 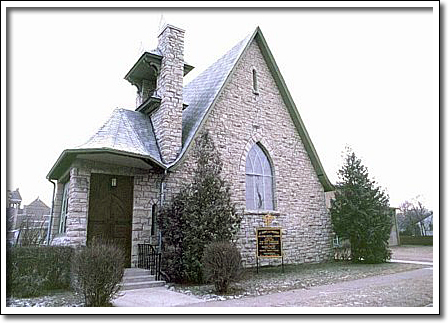 It is the third church built for the Parish of Portage la Prairie, which was founded by Archdeacon William Cockran in 1853. Archdeacon Cockran was an important missionary whose work at the Red River Settlement helped establish the Anglican Church in the West. The present church, designed by noted Winnipeg architect H.S. Griffith, is one of the finest examples of Gothic Revival architecture in Manitoba. At the Portage la Prairie church, architect Griffith used the standard vocabulary of the style: rough stone walls, a steep roof and the pointed arch for window and door openings. But Griffith gave the building more power and delight with a unique assemblage of forms at the main entrance, where the church's bell is also housed. The church is just as impressive inside, with stained glass memorial windows, fine woodwork in the pews, pulpit, and altar, and dark-coloured ceiling with the impressive open wood trusses.